How does Magnet Status Benefit Patients? What are Characteristics of a Magnet Hospital? St. Luke's Hospital has succeeded in achieving Magnet recognition for the third time from the American Nurses Credentialing Center (ANCC), signifying successful implementation of the national Magnet standards for nursing excellence. This voluntary credentialing program for hospitals recognizes excellence in nursing and is considered the gold standard in patient care. Of those U.S. hospitals seeking redesignation, only about three percent succeed. Magnet hospitals consistently out perform non-Magnet organizations with better patient outcomes and report higher patient satisfaction rates. Magnet hospitals also report increased nurse retention and job satisfaction. St. Luke's is the only hospital in Cedar Rapids to be recognized as a Magnet Nursing Excellence organization. 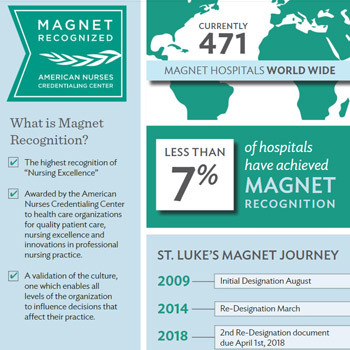 Hospitals that achieve Magnet status go through a rigorous review process and must provide documented evidence of how Magnet concepts, performance and quality were sustained and improved over the four-year period since the hospital received its first recognition. While at St. Luke's, the appraisers visited nearly every unit in the hospital, as well as our outpatient facilities and conducted countless interviews with staff and patients. "Being identified as a Magnet Nursing Excellence Hospital has a tremendous impact on the care we deliver and it takes every single St. Luke's associate to give the health care we'd like our loved ones to receive," said Carmen Kinrade, vice president, chief nurse executive, "This designation is an affirmation that St. Luke's has extraordinary patient care." The Magnet Recognition Program is administered by the American Nurses Credentialing Center (ANCC), the largest and most prominent nurse credentialing organization in the world, recognizing healthcare organizations that provide the very best in nursing care and professionalism in nursing practice. The Magnet Recognition Program provides consumers with the ultimate benchmark for measuring quality of care.